Republican Indiana Senate candidate Mike Braun criticized his opponent, incumbent Sen. Joe Donnelly (D., Ind. ), for using a Mexican axe in his new campaign ad. "As if ripping off a political ad from a parody of bad political ads wasn't enough, Mexico Joe is proudly wielding a product made in the country where Donnelly profited from outsourcing American jobs: Mexico," said Mike Braun spokesman Josh Kelley. "As Donnelly continues to put Mexico ahead of Hoosiers, it's time to fire Mexico Joe and hire American job creator Mike Braun." 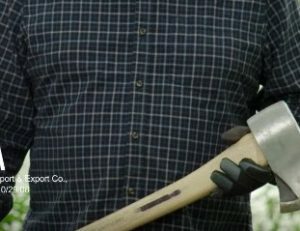 The ad the Braun campaign references features Donnelly chopping wood. The Braun campaign highlighted the axe used in the ad was manufactured in Mexico. 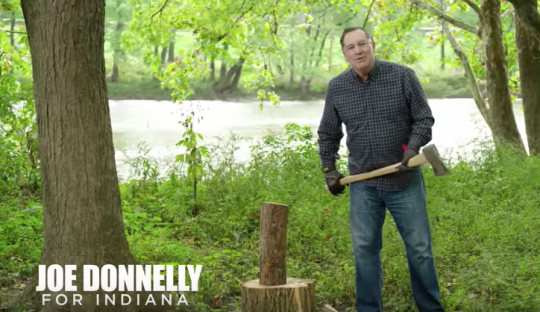 The campaign compared the axe Donnelly used to the one the company Truper sells on their website. It appears the two axes are identical. Donnelly has been a critic of companies outsourcing jobs to Mexico but has faced his own criticism for investments in his family company after its shifted labor to the U.S. southern neighbor. The Free Beacon reported that Donnelly increased his investment after the company moved some operations to Mexico. Donnelly told reporters he would sell his stock in Stewart Superior, a family company run by his brother, shortly after it was reported by the Associated Press on July 13 that the company had outsourced its manufacturing to Mexico. His campaign announced last week that the stock was not sold until Aug. 11, for $17,410. The ad itself has been a topic of criticism and jokes. Some compared it to an episode of "Veep" where character Jonah Ryan attempted to chop wood for a campaign ad. This entry was posted in Politics and tagged Indiana, Joe Donnelly, Mexico. Bookmark the permalink.